Bonus: "The global debt mountain"
While the world is slowing its debt binge, that's largely thanks to China and other emerging markets. Debt accumulation in emerging countries fell to its slowest pace since 2001, IIF found. 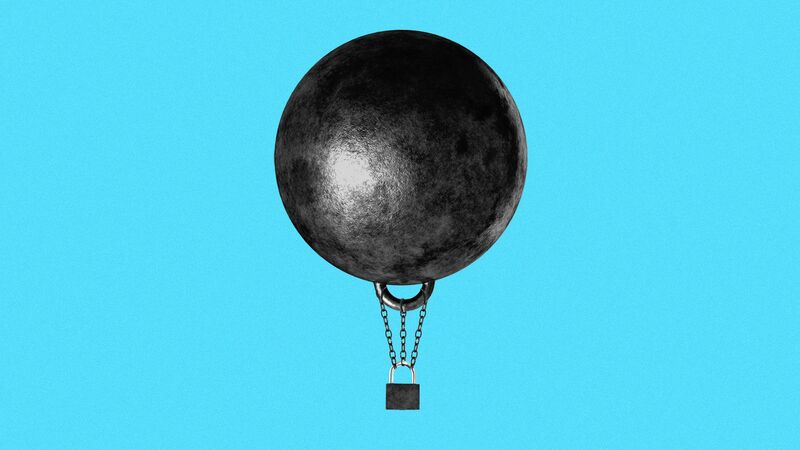 Conversely, U.S. total debt grew by $2.9 trillion to more than $68 trillion in 2018, the largest annual increase since 2007. General government debt accounted for more than 40% of the increase. However, debt rose at a slower pace than overall economic growth, pushing the U.S. total debt-to-GDP ratio to 326%, its lowest level since 2005. What's happening: Seaport Global analysts Michael Ward seared the company with a scathing "sell" recommendation on its third day of trading, notching a $42 target — $26 a share lower than its price at the time. The British pound has barely moved on major Brexit headlines over the past week, holding between $1.30 and $1.32 against the dollar. On Wednesday, it edged up just 0.2% during North American trading hours after Parliament approved a cross-party bill to block a no-deal Brexit by a single vote, an outcome many feared could lead to mass instability in Britain and Europe. The S&P 500 finished positive for a fifth straight day, equaling the longest winning streak in 2 months, and is coming off the best first quarter since 1998 and the best quarter overall since 2009. Active managers haven't been able to do much better than the index. Driving the news: Data from Bank of America Merrill Lynch shows just 39% of large cap active managers outperformed their benchmarks in Q1. The average large cap fund returned 13.7% in the first quarter, barely edging the S&P's 13.1% and lagging the Russell 1000 by 31 basis points. "March was a particularly bad month for large cap funds, with just 34% of funds outperforming their benchmarks vs. 47% through February," analysts wrote in a note to clients. "Quant funds underperformed even more, with just 21% beating the Russell 1000." Mid-cap managers were the biggest laggards, with only 26% beating their respective benchmarks in the first quarter. This follows a rough 2018 for active mid-cap fund managers during which just 30% of funds outperformed, BAML analysts said. Watch this space: In a separate note, BAML analysts noted the lack of real-money equity buyers in the first quarter. Despite a strong first quarter, hedge funds were the only net buyers of stocks, with the exception for corporations buying back their own shares. Buybacks are up 34% from 2018's first quarter, according to their data. Screenshot of Bloomberg reporter Joe Weisenthal's Twitter feed, showing trends in very small business hiring. U.S. companies added the fewest workers in March since late 2017 as construction and manufacturing cut jobs, ADP private payrolls data showed Wednesday. Private payrolls increased by 129,000, missing economist estimates of 173,000, and there was notable weakness for small businesses. 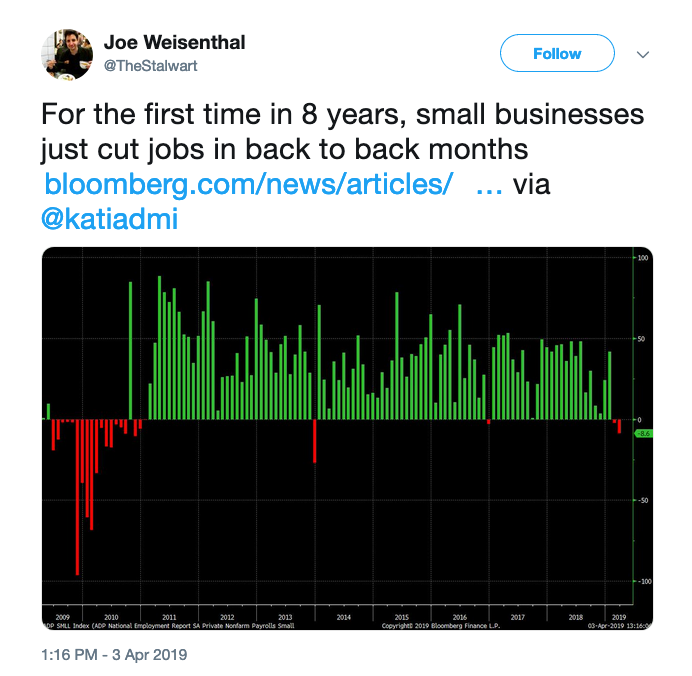 While small businesses overall added 6,000 net jobs, firms with fewer than 20 workers cut almost 9,000 jobs last month, the first back-to-back drop in 8 years. Small businesses in the goods-producing sector lost 8,000 jobs in March.